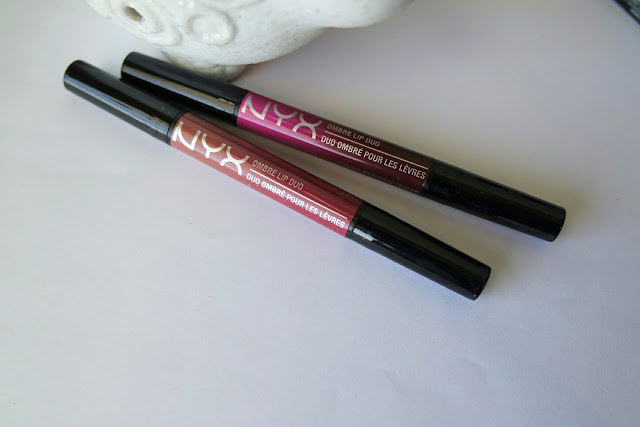 A few weeks ago, I placed an order on the NYX cosmetics website to try out several of their new lip products. I just couldn't resist after swatching these out in Ulta the other day. Today, I am going to be reviewing the new Ombre Lip Duos that came out with all of the new 2016 product launches. 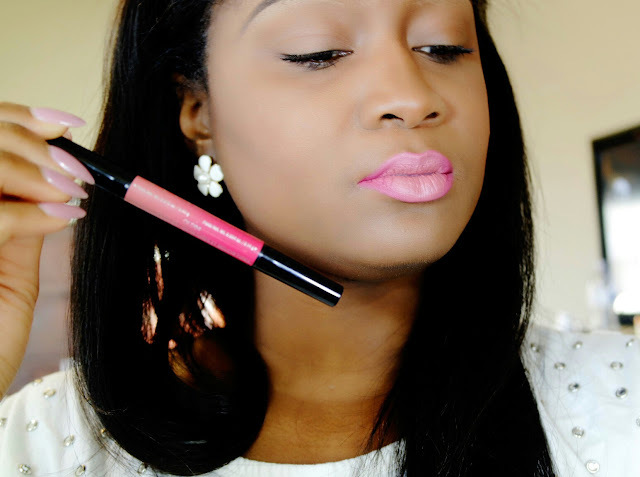 These lippies are a hybrid product of a lipstick and liner. 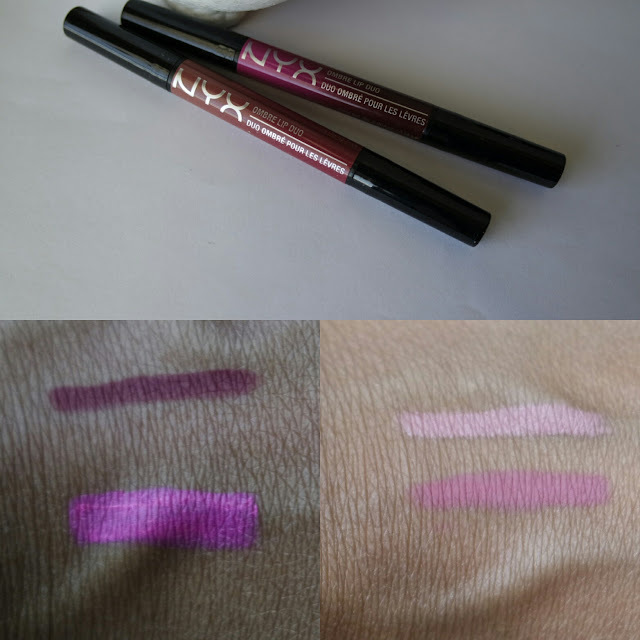 One side contains a fine liner pencil in a darker color and the other side has a creamy lip pencil about the size of a jumbo pencil. According to the NYX site these come in 12 shades and are $12.00 . "Dress your pout in two-toned style with our Ombré Lip Duos, the new 2-in-1 lip colors inspired by the ombré trend. 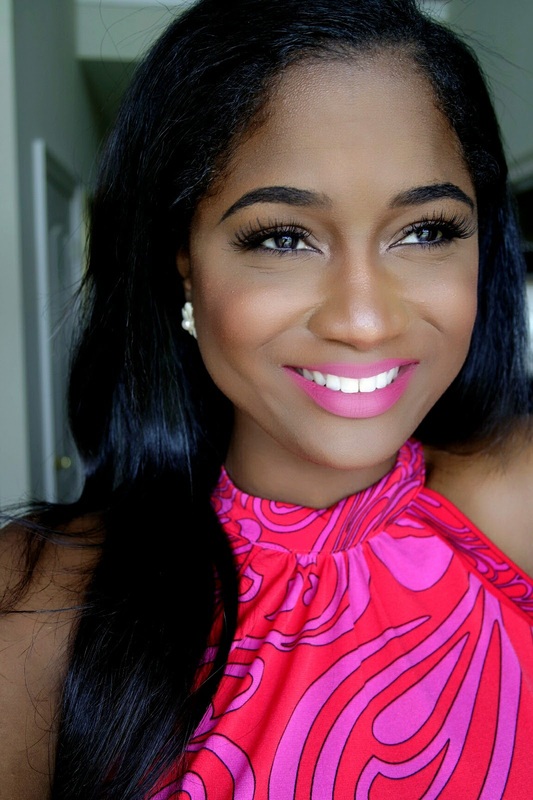 Each lip duo features two coordinating shades of lip liner and satiny matte lipstick to create the perfect ombré pout." I purchased two shade for review " Hollywood and Wine" and "Freckles and Speckles". 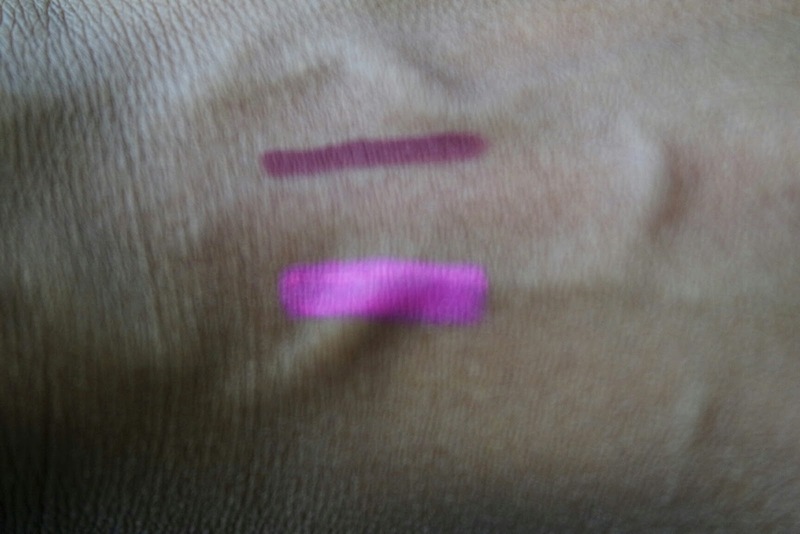 Here are some swatches on my hand and the lips before I jump into my review. I will be rating all aspects based on Pigmentation, Longevity, Packaging, and Performance on a scale from 1 - 5. OMG, these are so pigmented, I got amazing pigmentation and full on opacity with both the liner and the lipstick. It also only took one swipe for me to get that pigmentation which is always a plus. The hot pink lipstick stained my lips a bit, but nothing that was impossible to get off. The formula is super creamy. 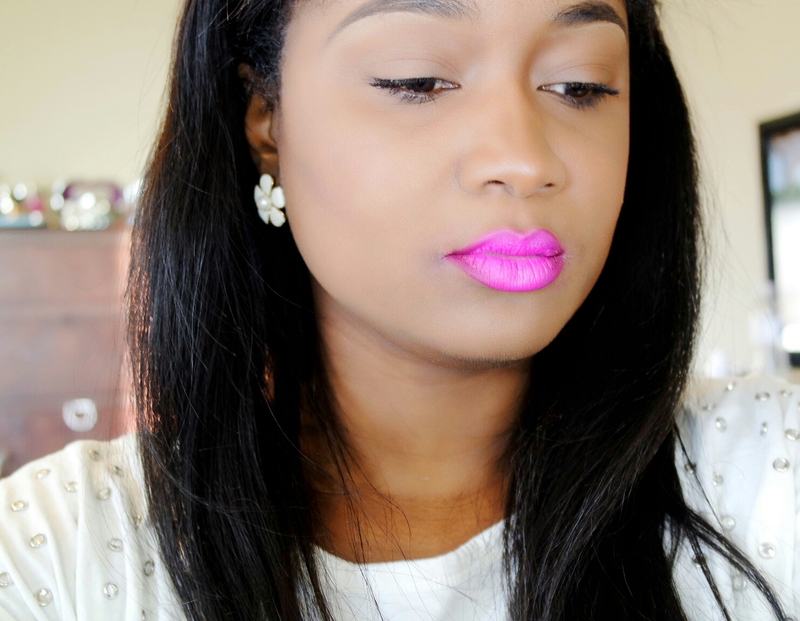 The lipstick side is more satin then matte, but the lip liner is completely matte. These lasted a few hours on me. I wore them to a Mardi Gras parade where I was eating, drinking and talking non stop and they lasted until I ate a sandwich. At that point, I found that it needed to taken off and reapplied, which can kind of be a pain since it is a two step product,. 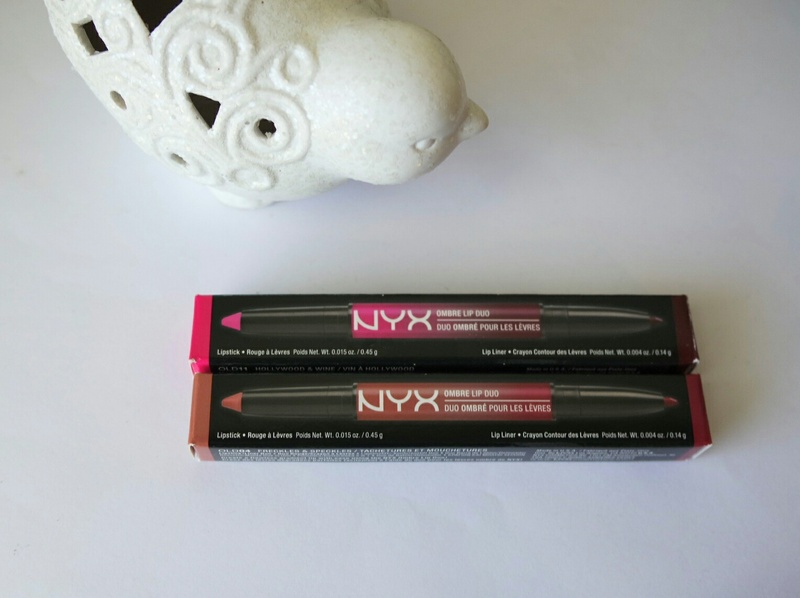 Both the lip liner and the lipstick come in pencil form which makes the product super easy to apply. It is also twist up so you don't have to bother with sharpening and wasting product. The lipstick side got a little knicked when I opened it because the cap is kind of hard to get off, but thats honestly probably a good thing. I don't have to worry about getting lipstick all over my makeup bag because there is a smaller chance of the top coming off. I love how these applied on my lips. The super sharp liner made it easier to get a precise line. The size of the lipstick side was also really helpful because it wasn't too big, which made it much easier for application. I also loved how the color combination looked together. Freckles and Speckles was much more subtle than Hollywood and Wine, but both duos were super complimentary to each other and I didn't have much of a hard time getting each one to look good together. I would recommend these to anyone who has hard time picking out complimentary lip combos. Also, I like how these glide onto the lip and the final look was super pretty. Comment below if you have these lip duos or plan on trying them.